Published in 1732, the twelve Fantasias for Solo Flute by Georg Philipp Telemann have become a staple of the solo flute repertoire. 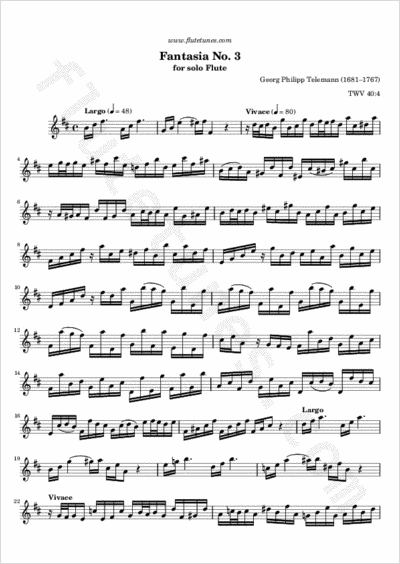 They were originally written for the transverse flute, but have been enthusiastically embraced by recorder players, many of whom insist that Telemann really wrote them for the recorder. The third Fantasia is in the key of B minor. It starts off with a few slow and melancholic opening gestures, but soon bursts into a frenetic Vivace, and finally ends with a lively ternary gigue. Thanks to John for suggesting this piece!